390 Marlborough is located on the south side of Marlborough, between Hereford and Massachusetts Avenue, with 388 Marlborough to the east and 392 Marlborough to the west. 390 Marlborough was designed by architect Samuel D. Kelley and built in 1885-1886 by building contractor John W. Shapleigh, for speculative sale, one of three contiguous houses (390-392-394 Marlborough). 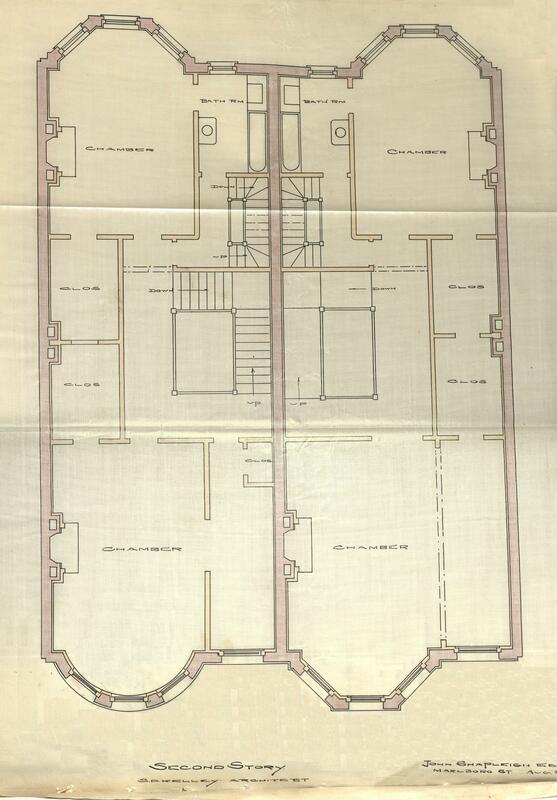 He is shown as the owner on the original building permit application for 390 Marlborough, dated September 3, 1885, and on the final building inspection report, dated July 16, 1886. Click here for an index to the deeds for 390 Marlborough, and click here for further information on the land on the south side of Marlborough between Hereford and Massachusetts Avenue. On April 12, 1886, 390 Marlborough was purchased from John Shapleigh by George Whitney Coleman. He and his wife, Isabella J. (Williams) Pollard Coleman, made it their home. They previously had lived at 39 Fairfield. He was a dealer in hosiery, gloves, and smallwares. George Coleman died in July of 1897. 390 Marlborough continued to be owned by his estate, and Isabella Coleman continued to live there. During the 1903-1904 and 1904-1905 winter seasons, Isabella Coleman was traveling abroad and 390 Marlborough was not listed in the 1904 and 1905 Blue Books. By the 1905-1906 season, she was living there once again. Isabella Coleman continued to live at 390 Marlborough during the 1912-1913 winter season, but moved thereafter to the Hotel Vendôme. She continued to live there at the time of her death in April of 1920. The house was not listed in the 1914-1920 Blue Books. 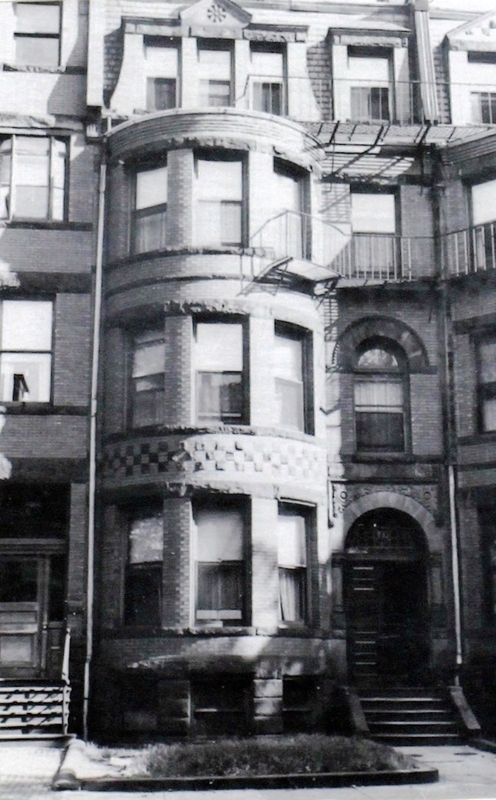 On June 4, 1915, the City of Boston took possession of 390 Marlborough for failure by George Coleman’s estate to pay the taxes due on the property. On February 12, 1918, the estate paid the back taxes and fees and acquired the property back from the city. On April 5, 1920, the City once again took possession of 390 Marlborough, the same month that Isabella Coleman died. On July 26, 1920, George Coleman’s estate once again paid the back taxes and fees and reacquired the property. 390 Marlborough was not listed in the 1921-1926 Blue Books. On June 18, 1924, 390 Marlborough was acquired from George Coleman’s estate by P. George Potter. On March 12, 1925, real estate dealer James M. Burr foreclosed on a mortgage on 390 Marlborough and took possession of the property. On the same day, it was acquired from him by George W. Judkins, and on September 29, 1925, it was acquired from George Judkins by Mary E. Bates of Quincy. During the 1926-1927 winter season, 390 Marlborough was the home of Mrs. Bertha Elizabeth (Roberts) Coats, the former wife of Herbert Philip Coats, who operated it as a lodging house. Their son, Herbert Philip Coats, Jr., lived with her. She previously had lived in Brookline. They had moved to 402 Marlborough by the next season. On December 5, 1927, Rebecca Raphael foreclosed on a mortgage she held on 390 Marlborough and took possession of the property. On December 13, 1927, it was acquired from her by her brother-in-law, James Y. Schooner. He was a note broker and dealer in mirrors. He and his wife, Carrie (Raphael) Schooner, lived in Brookline. By 1928, 390 Marlborough was the home of Annie Jane (Trimble) Varney, the widow of John R. Varney, who operated it as a lodging house. She previously had lived at 515 Beacon (also owned by James Schooner). 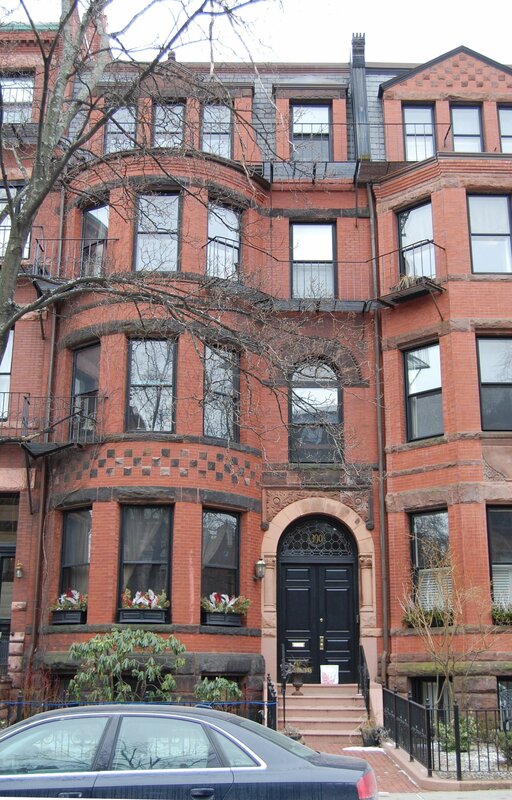 She continued to live at 390 Marlborough until about 1930, when she moved to 445 Beacon. James Schooner died in June of 1931 and the property continued to be owned by his estate. By 1931, 390 Marlborough was the home of Bror A. Pearson and his wife, Martha J. (Johansen) Pearson. He was a plumber, and they operated 390 Marlborough as a lodging house. They previously had lived at 517 Beacon, where they also operated a lodging house. On May 31, 1933, a trust established under the will of Henry O. Peabody, which held a mortgage on 390 Marlborough, foreclosed and took possession of the property. On February 26, 1945, it sold the property to real estate dealer Frederick E. Ordway, and on March 28, 1945, it was acquired from him by Samuel Siskind. 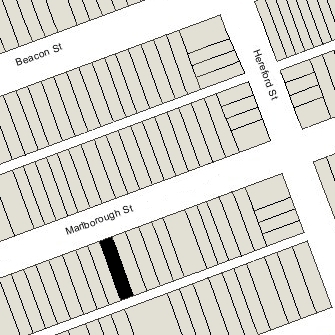 Bror and Martha Pearson continued to live at 390 Marlborough, and operate it as a lodging house, until about 1946. On March 27, 1946, 390 Marlborough was acquired from Samuel Siskind by James Joseph Feeley and his wife, Nettie Josephine (Bazinait) Feeley. They previously lived in Marlborough, Massachusetts. They continued to live at 390 Marlborough, and to operate it as a lodging house, until about 1953. On October 30, 1953, 390 Marlborough was purchased from the Feeleys by Joseph Hunter, trustee of the J. Hunter Realty Trust. He was a wholesale jeweler and an investor in real estate. He and his wife, Edythe V. (Sofnas) Hunter, lived in Brookline. By 1954, 390 Marlborough was the home of Mrs. Marion (Marian) Ann (Bourne) McKeever, the former wife of Francis Joseph McKeever, who operated it as a lodging house. Her son, Francis J. McKeever, Jr., and mother, Helen M. (Flynn) Bourne Martin, the former wife of Owen Phinney Bourne and widow of James J. Martin, lived with her. They previously had lived at 817 Beacon. Marion McKeever was a secretary and bookkeeper for Joseph Hunter. In December of 1955, she gave birth to his daughter, Noreen Judith Hunter. Helen Martin died in August of 1971. On December 23, 1982, Joseph Hunter transferred 390 Marlborough to himself and Marion McKeever, as joint tenants. At about that time, he began living there with her. Also probably about that time, Marion McKeever stopped accepting lodgers. By the mid-1980s, 390 Marlborough was assessed as a single-family dwelling. They continued to live at 390 Marlborough until the early 1990s, when he moved to a nursing home. Marion McKeever died in January of 1995, and Joseph Hunter died in April of 1996. After litigation, ownership of 390 Marlborough reverted to Joseph Hunter’s estate. On August 17, 1999, 390 Marlborough was purchased from Joseph Hunter’s estate by Jack W. Szostak. 390 Marlborough remained a single-family dwelling in 2017.